A major focus of the booming education technology sector is on products that aim to help teachers improve classroom practice. For their part, districts must figure out which of these resources will be most useful to schools. In New York City, the Department of Education developed its own Achievement Reporting and Innovation System (ARIS), which was rolled out in 2008. ARIS was an early effort at a system-wide data and teacher collaboration platform, and a major undertaking for the nation's largest school district. In 2011, the Research Alliance received a grant from the Spencer Foundation to investigate how this ambitious initiative played out in schools. Our first report focused on overall use and perceptions of ARIS. 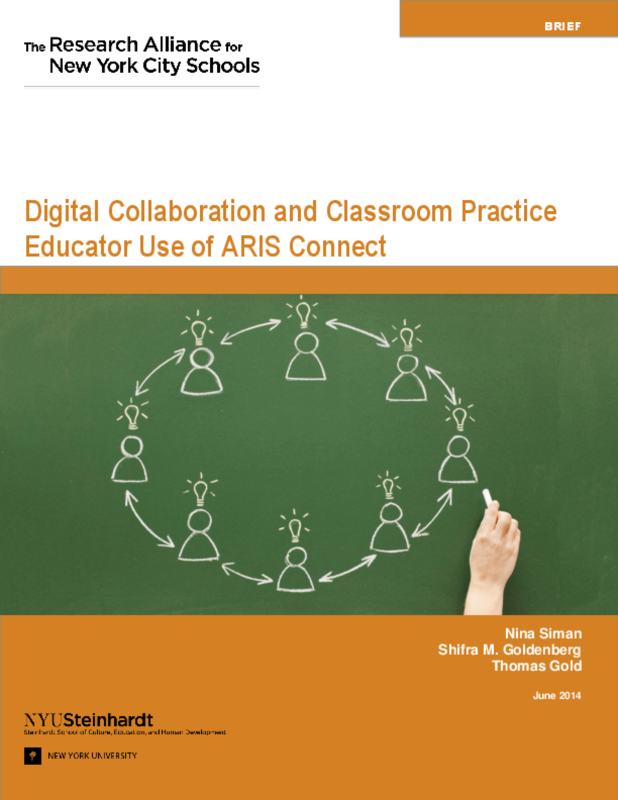 In the current phase of our study, we honed our focus onto ARIS Connect -- a component designed specifically to help educators improve their practice by sharing resources, posting questions, and giving one another feedback, both within schools and across the district. Our investigation sought to understand what educators thought of Connect, and whether, as its designers intended, Connect supported their ability to communicate with other educators and improve classroom practice. The study is based on two years of "clickstream" data, which tracks user visits to and navigation through ARIS. We also visited nine middle schools that recorded higher-than-average use of Connect, where we interviewed administrators and held focus groups with teachers. This report presents our findings, including insights on why educators did or did not use Connect; what might have made Connect more useful; and what external tools educators use for similar purposes. Copyright 2014 by The Research Alliance for New York City Schools. All rights reserved.